High Five - Give me HTML5! Turtle's new Facebook commenting will not only add a handy commenting tool to your albums but it will manage all the community integration, posting to timeline, notifications, etc. – and thanks to Facebook's networking effect your albums can reach 100s of people in no time. Many users of Turtle, I guess, haven't even noticed the new Facebook commenting tool, or perhaps thought it's something too complicated for them. No, I can tell you, it shouldn't – even I was surprised how smooth it goes. Now I'll show you the 3 easy steps to put this awesome tool into good use. Now that Facebook has created an app for you can simply copy the App ID to jAlbum's appropriate box. 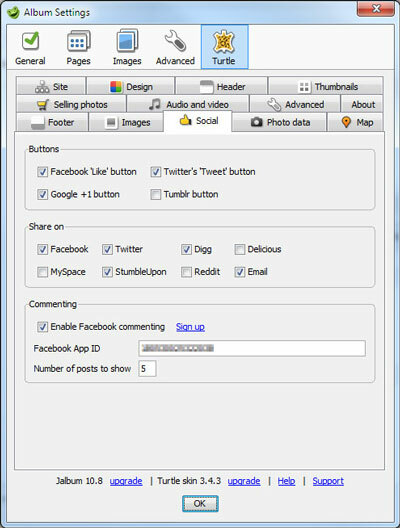 Go to Turtle's Social settings tab and turn on Enable Facebook commenting. 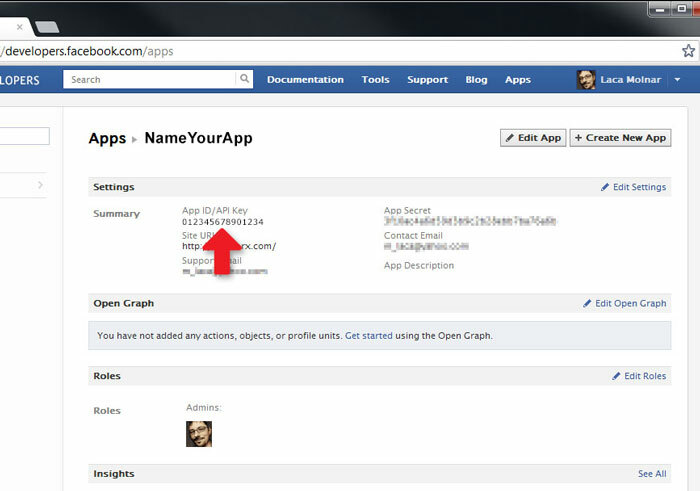 Paste the app ID you've copied from the Facebook site. Normally you don't need to change the Number of posts to show, but you can make it a bit higher if there's enough space. Note, this is not the total number of comments to show, only the number of comments to show in the initial view – the visitors can expand it any time if they want to see more. Make the album and Upload to your site! Please note, you cannot test the Facebook commenting on the local Preview, because that?s not visible to Facebook servers. Hello, I can't figure out how to add an admin to allow comments moderation. This is a new option that is not described here above. The question is how the admin name should be enterred in the box ? It is still not working and I've tried different webbrowsers. But when I go to my website on my iPad it is working!?!? What can this be? Don't know if it has anything to do with it. 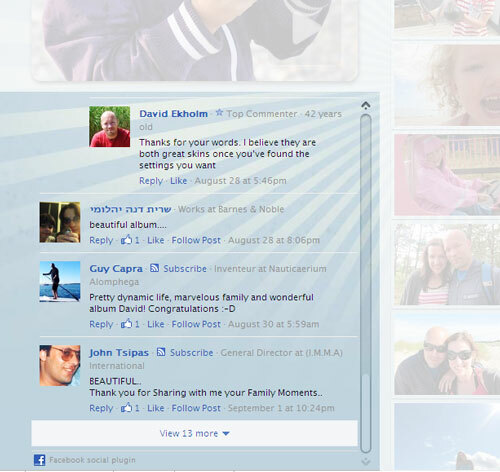 Should this Facebook commenting work without the " Make slide pages" checked? Thanks for the help. In the end I decided to go back to chameleon. I didn't like the way the folders displayed and in my Jalbum at least the album image locked. The buttons to let me change location was greyed out. @seraphimsphoto: 1. the default size is 200x150px in Turtle - if you open an old album it takes over the old thumb dimensions. Change it through the Settings / Images / Image dimensions settings. 2. To change the album thumbnail just use the little triangles below the Settings / General / Album thumbnail, or even easier: select the photo in thumbnail view and right-click -> Use as folder image. 1- The folder thumbnails in Chameleon (which I was using) are rectangular. They are square in Turtle. 2x3 (100x150) Standard size rectangles would work better. In order to see what's wrong I need to peek into your page. Please sent the URL to laza at jalbum dot net. "Not public to Facebook" means the album's folder is password-protected (or local). The Google plus button might not work if the google plus library hasn't been started when the skin starts to generate the buttons. This can happen if you have several Like, Share buttons or other external libraries (e.g. Maps). I made a modification now, so the skin will try to start the button 20 times, 200ms in-between the attempts. Will be available with the next skin release. Hello! I'm trying to get this feature to work, but on my Turtle jAlbum Photoalbum site nothing is showing up from Facebook. And I did follow your "3 easy steps" to the letter to intergrate the Facebook commenting tool on my site where I put the Turtle photoalbum. I see that you answered Christopher Werby that if your site is not public to Facebook, it won't work. What do you mean by "not public to Facebook"? And how am I get it public to Facebook if it's not? If I get this app working I will consider upgrading jAlbum. the page in a browser locally, and not after it's uploaded. Just the Facebook like-button are showing. Hi Marco, see Step 1. Not Facebook ID, but Facebook App ID. i don't know what's the facebook id, sorry i'm starting. 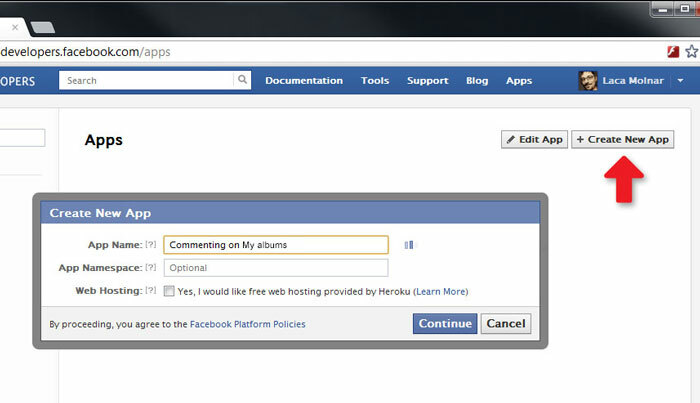 No, unfortunately if the page is not public to Facebook, you can't integrate a facebook commenting into it. Trying to understand this feature. Is it correct that if I have a Photo Album on a protected server, then I can't use this feature? I have a photo album that isn't meant to be shared generally, but is meant to be shared among a group of people who traveled together. I was hoping to use this new commenting feature to enable them to each add "captions" to the images. But that's not going to work, is it? Thanks! And Turtle skin is awesome!